I read mostly secondary sources and scour them for juicy details that make information come alive. Kathleen Krull has written many outstanding biographies and picture book biographies for children. It seems pertinent to share one of her “oldies, but goodies” this week, Lives of the Presidents: Fame, Shame (and What the Neighbors Thought). 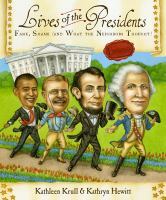 Since the book was written in 1998, she has vignettes starting with George Washington and ending with Bill Clinton. Even though the book doesn’t include George W. Bush, Barack Obama, and Donald Trump, it contains enough anecdotes to entertain even a serious historian. Do check out Kathleen Krull’s website for more information about her and her books. The author talks about gossip and how she finds her information in the following video.